Review: This book really reeled me in because it is a fun kids book. When I was reading it, I couldn’t stop. This book it more than exciting, and also has a very fun story to it. 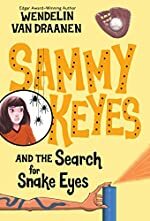 This book by Wendelin Van Draanen, is called Sammy Keyes and the Search for Snake Eyes and is in Santa Martina. As a reader I really enjoy books and this one was very compelling. I thought this book was truly amazing and very well written. This book was the seventh Sammy Keyes book written in the series but they don’t really go in order. Sammy and her friend Marissa are trying to crack the case of who Pepe’s mom is and why she was given a baby at the arcade. When trying to keep the secret that she lives with her grandmother and keeping away from gangsters, she doesn’t know what to do, but you know Sammy, she will do anything to get things right around town. As a team, Sammy and Marissa go through bad times like being spied on, and good times like finding Pepe’s moms relative, but not finding her in person. Is getting stuck in a basement your kind of happy story book ending? Overall I enjoyed this book and want to read more of them in the series. I highly recommend this book for middle school readers of 9 year olds because, again, it is so wonderful because you can see it happening in your head and picture being one of the characters. Review written by Summer, Grade 6. Date of review: October 2008.